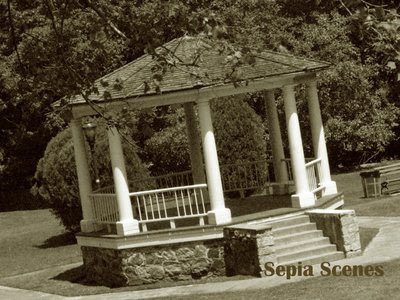 Welcome to Sepia Scenes again this week my friends! I have 3 photos for you: they are from the community in which my SIL lives. Again I did some photo-editing using Curves in Adobe Photoshop 7. Those are geraniums on the balcony. A little bit of fencing. Next week I'll select a few of your photos to show off on this blog. Go over to Ruby Tuesday to see what I did last week over there. Okay people so sign Mr. Linky and leave a comment! Happy Canada Day to our Canadian Friends!! Click to go to Work of the Poet for an extended greeting! Your SIL lives in a real classy hood. Photogenic too. Nice work! I'm trying something new out over at WWHYH... check it out if you get a chance. Photographically Challenged #1: Who Needs a Meme When You've Got Light Like This? 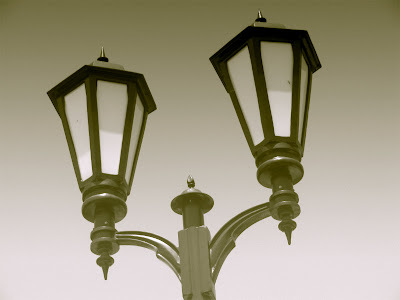 Hi Mary - my favorite of your three pics this week is the light post. I think Victorian-style bits of architecture like that are just perfect for Sepia Scenes! Don't know if you do anything on Flickr, but I joined the Sepia Club group on there and was wondering if you'd mind if I did a Sepia Scenes group? Or if you would want to? This week, Daphne is posing in a Sepia Scene at Purrchance To Dream and at It's A Blog Eat Blog World I have shots of a statue from a cemetery here in Michigan - the close-up one I really worked hard on to do special photo-effects on just for Sepia Scenes, and would love feedback on it. Cool shots, Mary. I do like white fences! I like them all but I think I like the fence best. It appealed to me on my first glance. This week I used a dry brush filter. I like how it came out. I admire your signature that is cool how did ya do that? yep, the light post for sure. I love the lamp post photo, but the fence is cool too. I can't decide. 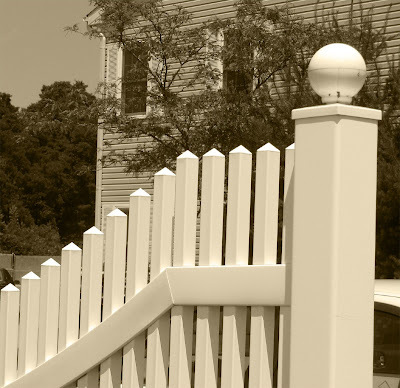 The sepia tone helps age the modern materials (siding, stair railing and lamps). We like old style but modern buildings are easier to maintain. The nice balance of old and new bridges both styles while adding the classic look. A nice view of the stylish sepia aging! The street light looks awesome. Woods and metals come up beautifully in sepia! Love the perspective of the fence palings in the last photo! Hey there, I'm back after two weeks in France! Love the new badge, I should remember to use it next time! I love this series, especially the last one, that's MY favourite! Hi Mary! These are good! They turn the new old again! 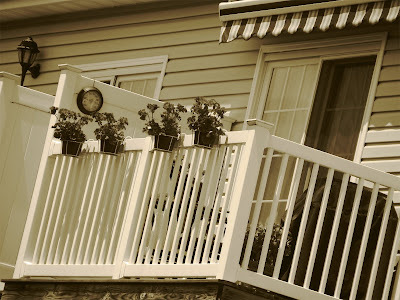 I like the balcony scene with the awning. I don't know why - but for some reason the awning caught my eye! These are beautiful shots Mary. LOve the sepia effect esp. the fence! Love all your photos! I really like the fence. Would love to have one like this around our yard. Mine is posted at my place, A View of my Life. Have a great day!! Picture one is my favorite. 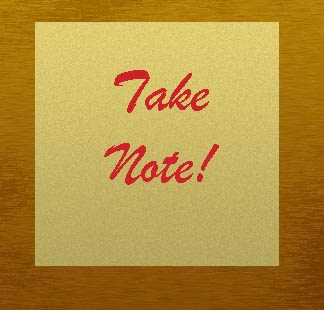 Hi I'd like to thank you for such a great made site! Was thinking this would be a nice way to make my first post!